"American Idol" is one step closer to guaranteeing a female victor this season, as another male bit the dust on Thursday's (April 4) elimination episode. 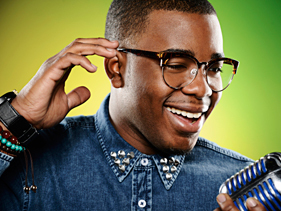 Burnell Taylor was voted out of the competition, becoming the fourth male voted off the show in four weeks. With Taylor's exit, he leaves Lazaro Arbos as the season's lone male standing. Taylor was in the bottom two Thursday along with country starlet Janelle Arthur. More than 25 million votes were cast following Wednesday's performance episode, according to host Ryan Seacrest. Taylor, the 19-year-old New Orleans native who dropped 40 pounds between his audition and this season's semifinal rounds, sang India.Arie's "Ready for Love" in his attempt to get the judges to use their save. They didn't pull the trigger, and Randy Jackson delivered the bad news, telling Seacrest, "Unfortunately, Ryan, we're not going to use it. Sorry, Burnell. Good luck, good luck. We love you." Prior to Taylor singing for the save, Nicki Minaj did her best to soften the threat of elimination to him and Arthur. "We have the best of the best, so when you go home now, this is not a failure by any stretch of the imagination," she said, possibly alluding to last week's post-elimination dustup between her and Devin Velez. "This is a win — win, win, win." Taylor was one of mentor Jimmy Iovine's two picks to be in the bottom, along with Arbos. Iovine said in his Wednesday night performance of Bon Jovi's "You Give Love a Bad Name," Taylor "got it all wrong. He gave rock a bad name last night." He said Taylor was "so behind the beat that it sounded like the band was playing on East Coast time and he was singing in West Coast time." He harshly criticized Taylor for not studying his song. Still, Iovine had Arbos, not Taylor, picked to go home. But the resilient Arbos was a surprise member of the week's top three vote-getters, along with Angie Miller and Kree Harrison. Earlier in the night, Iovine and the judges were each asked to pick their top three of the week, and save for Mariah Carey, they all chose Miller, Harrison and Amber Holcomb. Carey mixed it up by selecting Candice Glover along with Harrison and Holcomb. Also on the show, Carrie Underwood stopped by to perform her new single "See You Again," and "Idol" season-nine finalist Casey James performed his latest single, "The Good Life."